My living room is 'blah'...I'm fairly certain 'blah' isn't a technical term but if I had to define it, 'blah', would mean: lacking personality, color, and overall aesthetic appeal. There are certain elements that I like but I certainly need to bring in more color, paint/change my coffee & end tables, and possibly find more furniture, as the space is quite a bit bigger than the living room in my condo. 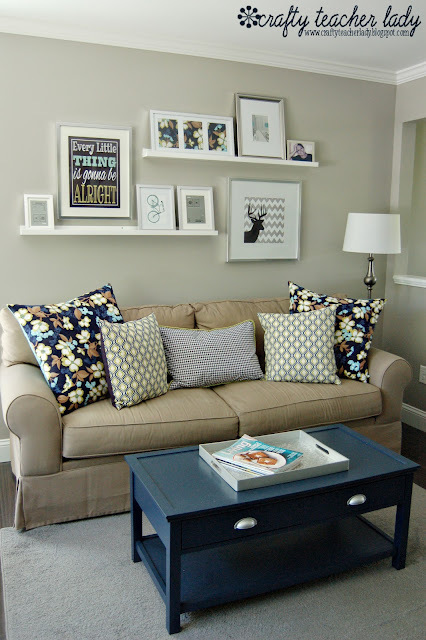 I love the neutral furniture with pops of color. My biggest conundrum has stemmed from finding colors that will work with my current living room set (chair, ottoman, and couch). I'm not in love with the color or style of the set but it was the first set I bought a few years back and I can't afford a new one at this point so I have to make it do! I'm in LOVE with the navy dogwood print fabric from Warm Biscuit!! 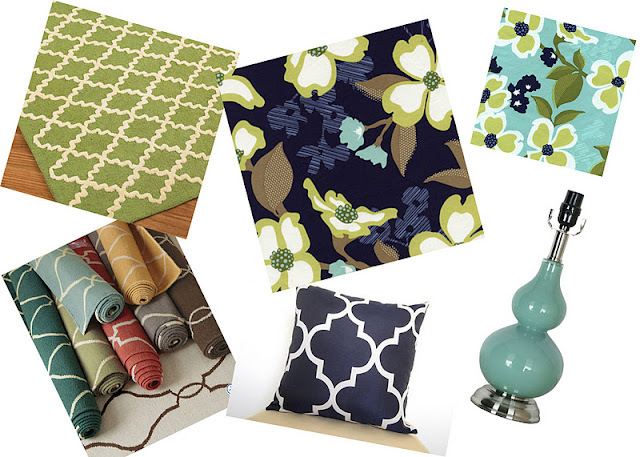 I'm not sure why I never thought to bring navy into the space, as I have always loved a navy/green color combination! But, I will now use this print as inspiration to pull colors from & to design the entire room. I'm loving that aqua lamp from Lowes and some sort of trellis pattern rug to pull from the colors in the fabric. 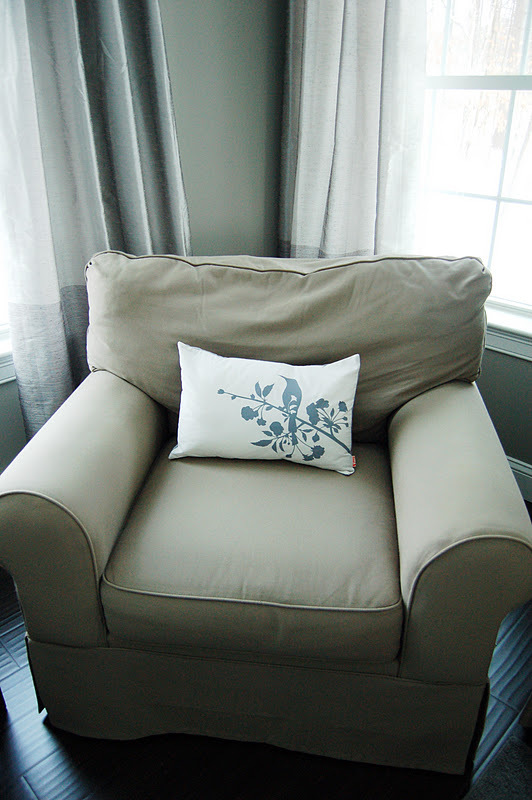 There's also an aqua dogwood print that coordinates with the navy. Since the fabric is on the pricier side (I found some on Etsy but only in a small quantity), I only purchased two yards to make pillows or framed art with. It's a good start! This is beautiful! I Are all the frames from Ikea? I really love your shelving arrangement! 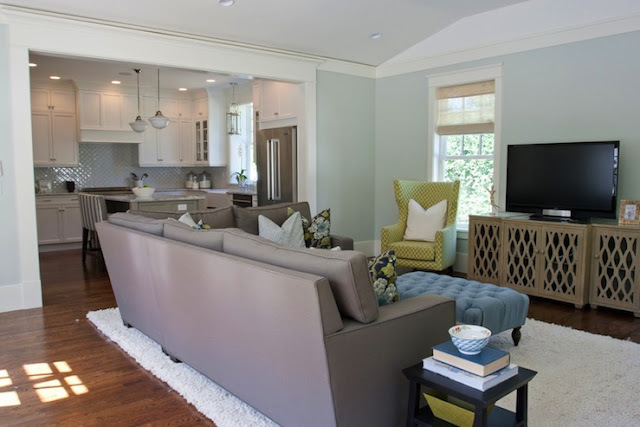 Hi, can you tell me the source for the green trellis rug? It's so cute! Loving your room with the Pussywillow color, is it a greige color or is there a hint of green in it? 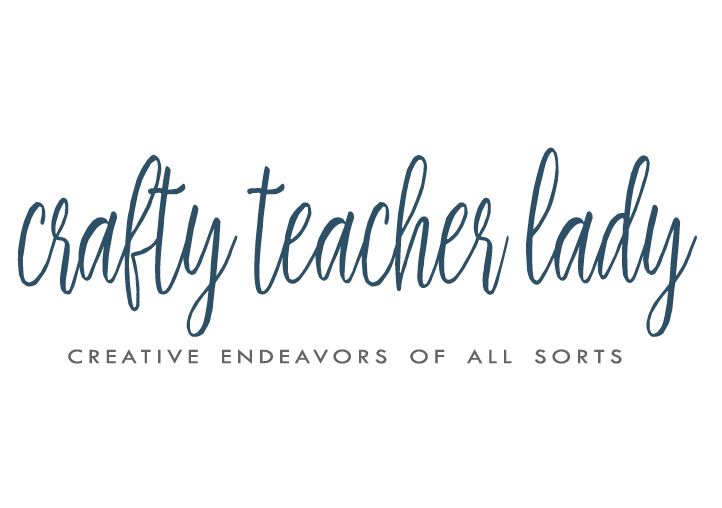 Adding you to my bloglovin account! ps: that inspiration room is to die for!! Thanks! I'm not sure of the source for the rug but Rugs USA has a ton of similar styles and colors. The paint color is really a greige/taupe color, no hint of green (at least in the rooms in which I've used it)! Thanks for stopping by!